A software update will allow Tesla Model Ss to drive themselves on the freeway, Elon Musk has announced in a bold challenge for regulators and competitors, according to a Wall Street Journal report. Tesla update 7.0 will let a Model S do the driving on highways and allow an owner to move the car around without anyone inside on private property, the Journal said Friday. 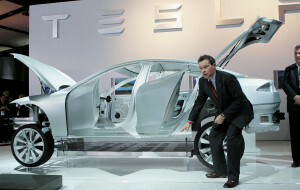 Musk announced the decision March 19, the Journal reported. Self-driving on private property to pick up a driver — known as “fetch” — was “presumably to be used in parking lots or garages,” the article states. Nothing like it exists on the market now, and Tesla’s update would even be beyond that intended for the Audi Q7 in 2016, according to the Journal, though it didn’t specify how. The Audi Q7 will drive the car itself require the driver to signal the autonomous system that they in fact are paying attention, the Journal said, which could solve the concern that an automaker (or dealership, presumably) would be liable as well as the owner for a self-driving car crashing. That would also presumably ease regulators’ minds a little, too. Most Model Ss are sold in California, but no regulations exist for any self-driving cars which aren’t experimental, according to the Journal. The California Department of Motor Vehicles is trying to produce them now. “We have been trying to get a handle on what they are planning to do,” DMV Deputy Director Bernard Soriano told the newspaper. National Highway Transportation Safety Administration leader Mark Rosekind supports the concept of self-driving cars, and Musk said Tesla is already talking with the agency, according to the Journal. “Like all vehicles on our roads, it must meet the applicable federal safety standards and must not present an unreasonable risk to safety,” it said in a statement. Bugproof self-driving cars could eventually have a huge impact on the collision repair industry, but estimates in the past indicated autonomous vehicle technology would’t be ready for years — and society would have to work out what it’d look like from a tort and regulatory perspective. Musk’s move — besides showing that you don’t need a dealership to upgrade the on-board software package — throws down the gauntlet on the latter and also might spur competitors to step up their own self-driving game. In other autonomous vehicle developments, Hyundai said Tuesday it plans to sell cars with self-driving capability in 2020, according to Reuters. Few other details were provided.